I wanted to tell you about an excellent adventure story, published in 1890, that I read recently. 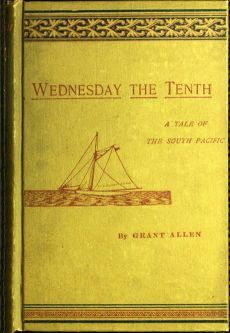 The book is Wednesday the Tenth: A Tale of the South Pacific by Grant Allen. To be honest, I picked it up because it was short and I wanted something that would be easier and quicker to read than my usual fare. I’m glad I did, though, because it was an exciting and suspenseful tale that had me enthralled to the end. It starts with a rescue, when two boys in an open rowboat are discovered in the middle of the Pacific Ocean by a steam yacht plying its trade among the islands (yes, I know that’s a sailing boat on the cover, but it is definitely a steam vessel in the book). They are the children of missionaries and they tell a harrowing tale of slave traders who get the locals drunk and rouse them up against the family, after the father thwarts the slave traders’ attempts to get the locals to sell people to them. The family are taken prisoner and held by the locals who plan to kill them—and then eat them. The boys manage to escape and set to sea in the rowboat, in the hope of finding help. Then it was evident he could not say another word. He sank back on the pillow breathless and exhausted. The color faded from his cheek once more as he fell into his place. I poured another spoonful of brandy down his parched throat. In three minutes more he was sleeping peacefully, with long even breath, like one who hadn’t slept for nights before on the tossing ocean. Wednesday the tenth of the month is when the sacrifice is scheduled to happen. The boys are convinced it’s Friday, but the sailors on the yacht are equally convinced it’s Saturday. Even so, the yacht’s captain gives orders to make for the island at full speed, sure they’ll make it in time. Now, obviously, all doesn’t go as smoothly as anticipated or there wouldn’t be a book to read. As they get close to their destination they run aground on a reef that isn’t where the charts say it should be. And so we were, this time with a vengeance. “Back her,” I called out, “back her hard, Jenkins!” and they backed her as hard as the engines could spurt; but nothing came of it. We were jammed on the reef about as tight as a ship could stick, and no power on earth could ever have got us off till the tide rose again. Well, we tried our very hardest, reversing engines first, and then putting them forward again to see if we could run through it by main force; but it was all in vain. Aground we were, and aground we must remain till there was depth of water enough on the reef to float us. They get off the reef, but the yacht’s damaged, and they’re running out of time. Between engine troubles, the tide and a contrary wind will they make it before the missionaries are killed and eaten? You’ll have to read it yourself to find out. This entry was posted on Wednesday, September 10th, 2014 at 12:01 am and is filed under Book Review, Project Gutenberg. You can follow any responses to this entry through the RSS 2.0 feed. You can leave a response, or trackback from your own site.